Both of my girls are going to have cupcakes at their birthday parties (Leia in April and Hannah in May). I do not own one of those fancy cupcake stands but thought, hey, I could probably make one but first I need to figure out how by looking at…you know it…pinterest. The blog I found that I thought had the best system for making one was Annie’s Eats in her post, How to Make a Cupcake Tower. The picture I posted above is just the start of mine but I am so excited about how it is looking (and the fact that I am using empty diaper boxes to make it)! Might as well use the diaper boxes, I paid enough for em’. I just cut my diaper boxes into usable flat sheets of cardboard and then cut the circles out of that. I traced the lid of my cake saver container for the largest tier and one of my small dinner plates for the smallest tier. 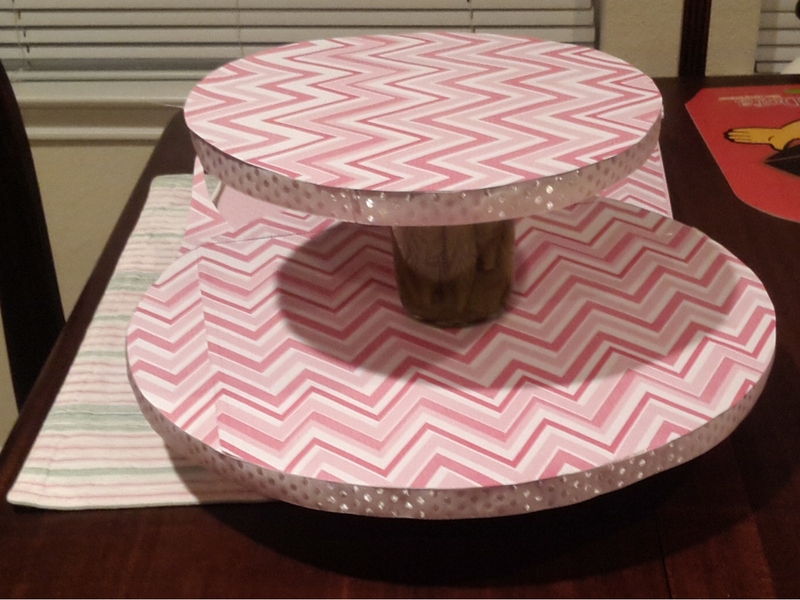 You need two circles for each tier since you need two circles glued together to make a stable enough “shelf” for the cupcakes. Yes, there is a jar of pickled okra separating the tiers right now but eventually I will have some wrapped cans in between and I still have to make the middle tier. What you see here are the top and bottom tiers. I was also able to use some ribbon I already had laying around so that was nice and made the project even more affordable. The only thing I have purchased so far is the scrap book paper and it was on sale today at Michaels. Since Leia’s birthday comes first, this one will be for hers–I will probably add some Star Wars stickers soon. After her party I plan on recovering the tiers with other paper and replacing the ribbon with Disney Princess ribbon I bought today at Michaels since that is the theme of her party. This has been super easy so far and I will post more instructions when I have a finished product! Linked up at New Nostalgia & Housewife How-To’s. 5 Responses to "Cupcake Stand Part 1"
Making your own cupcake tower is a great idea. I happened to find a Wilton one on sale so I bought it, but still have to spruce it up…..which makes me think I should have just made my own! Lol. I love cupcakes and this cute way to display them is going to be a project for us. I recently started a Thursday link-up party (yes, today:), and I would really love to see this post and/or any others you would like to include. I am at allthingswithpurpose.com. Hope to see you there and for many more Thursday’s to come! !